Touche Rooftop Lounge & Restaurant, centrally located in the heart of Downtown Miami's Arts & Entertainment District. 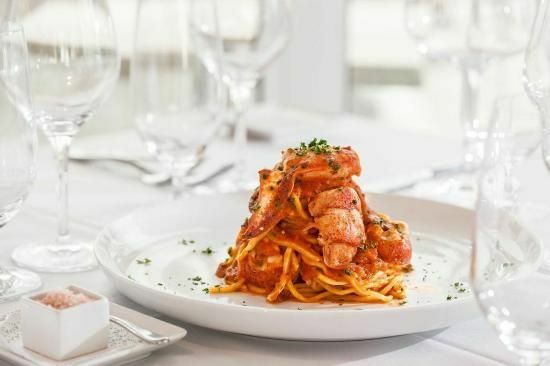 The intimate 48-seat indoor dining room features an open kitchen and serves an array of classic Italian dishes ranging from Classic Meatballs and Beef Carpaccio to pastas such as Lobster Fra Diavolo and Asparagus Risotto. Main dishes including Colorado Lamb Lollipops; Red Snapper with Gaeta Olives, Teardrop Tomatoes and Caperberries; and Salmon Harissa. The menu also offers sushi and sashimi including the Tropical Citrus Salmon Roll and Halibut Usuzukirui Sashimi for those guests that would like a lighter option or would like to share. The Rooftop Lounge is a sophisticated rooftop lounge that offers an exclusive menu, with its well-mixed cocktails and specially chosen wines that never tasted so good as they do in this open-air South Beach-inspired atmosphere. This indoor/outdoor lounge and bar via a retractable roof is the perfect place to start your night. This new downtown Miami hotspot hosts some of Miami's most popular live band performances, singers, jazz quartets, salsa orchestras, and resident DJs. The 7,100 square-foot wood plank deck includes design highlights such as fire-pits, communal tables, comfortable couch seating, and features a rooftop band shell perfect for live entertainment and watching sporting events on the 16ft x 10ft LED screen.